“You’ll Miss Me,” she said. I shrugged and made some smart remark. The kind kids make to their moms. Avoiding. No way was she going to make me “feel”. And, no way would I admit it if I did. My son does the same thing to me. Pride runs deep in this blood. Oh, pride…how big and strong you are. How mighty and wise. You don’t need anyone. Only, pride wasn’t so mighty when death came calling. Oh, how she tumbled, as I crawled into the bed beside my tiny giant of a mother, the one I rarely hugged in this life, and cradled her in my arms like a baby, stroking her hair and singing soothing hymns. Singing the fear away. It’s funny the things that disappear when death comes calling. What you think is so big right now, in life, in the pride of it all….it won’t matter in death’s shadow. That’s the one beauty in the darkness. The stark, incredible beauty of being stripped of everything….except the love. The love remains. Years of broken promises and not enough lay crumbled in the corner. Pride…she falls first. And, you know what they say about the bigger they are, right? Grudges, hurts, anger…none of it can stand in the face of death. There is nothing like the desperate longing for another person that cannot be satisfied this side of heaven. The realization that I could search the entire earth and never find her overwhelms my psyche. Overwhelms isn’t even big enough to describe it. There isn’t a word to express it. So intertwined we were, she and I. Six years later, I remain stunned that I seriously have to continue living on planet earth without her. Sometimes, I’m 8 years old….and I don’t know how. I’m glad she never knew this level of missing. The thing is…even if your mom makes you crazy. Even if pride stands ugly between you, smug in it’s victory….life is different, as long as she’s here. And, I am left here, without pride’s thin layer of protection. No longer captive under the façade. All the raw reality of my love and longing for her is exposed, released in a flood, and there is nothing I can do to hide the truth of it. No mask. Sure, life goes along. And, then…it washes over me. In the moments. The times when a girl, no matter how old she is, just needs her mom. Some things you can only trust your mother with…and how…how do you face the unspeakable things, the woman things, the deep, sacred things…. I know the right answers. And, His Word will forever be my soothing balm. I know about dwelling in the shelter of His wings. I’m there…even in my broken, crazy missing. Still, even as He carries me, this ache remains…until heaven’s reunion. As it should…because we weren’t created for goodbyes like this. This earth, in it’s current state…this is not our home. This is not what our loving Father intended for us. Oh, Mom, I miss you with a consuming missing. And, you know what…it doesn’t even bother me to picture her smiling, just a little…with the knowledge that she was right. My mind has been thick with nostalgia and my heart heavy with the missing as Christmas fills our senses. Flashes of yesteryear…moments captured in time like a snapshot stopping my hurried steps. I am seven, standing proudly in the black leotard and pink tights my mother worked three jobs to buy, my long, wavy brown hair pulled into a bun. Silver Bells fills the studio with a melody that makes me close my eyes and really believe it’s Christmas time in the city . I practice my plies as little girls with more grace than I…girls who don’t live in the trailer park…snicker in a group. I look at my mother, standing a little straighter , my tiny pink ballet slippers gliding across the worn wood floors. Ballet was never my thing, but that year, with snow falling in the background, Silver bells filling the air…that year was magic. Another flash…another year, 1980-something…another moment captured in time. My mother, wearing the long nightgown with the zipper our neighbors gave to her one Christmas morning. They started the tradition of coming over Christmas morning shortly after we moved to the first house my mother owned. The flashes run together in a blur of memories. I can still taste the orange and bag of candy consumed on many a Christmas Eve at the prettiest church in town,laughing with Billy…his mouth full of chocolate. My grandpa laughing an identical laugh in unison with mom , his arm draped around her, eyes wrinkled with joy as he gives her shoulder a gentle squeeze one Christmas Eve. The house lit up like Vegas…different themed trees in every room. Her tree. Her home made ornaments documenting the various themes of each year’s home made Christmas…the macaroni angel, the year of crochet, cross stitch, the year of wooden peg angels, the year we filled my cart with mauve Victorian decor and bought the Mariah Carey Christmas CD at Hills. Shopping with my mother so many Christmases of my grown up life. Oh how she loved to buy presents for her people. Flash…mom pushing me in a wheel chair so I could shop while on bed rest for Faith and Grace. Flash…the year she bought me a brand new tree as we shopped on a day when we were angry with our husbands. She always spent more on days we weren’t happy with our husbands. Baking with Nicki and her people…making buckeyes for the first time…marveling at the gathering of women. Flash…my own Gerken baking day…with Sarah and a young Timothy and even younger James, covered in flour. This year’s Gerken baking day left my kitchen filled with big kids who are not mine by blood, but certainly mine in my heart. Cousins filling my grandmother’s house, families young and full of promise…moms wearing 80s attire…big bows around their necks with big hair to match and hips curvy from the birthing. The smell of grandma’s homemade noodles filling the kitchen. Seventies carpet. Gathering around the fireplace, the noise of family…filled with love and security. Life ahead. Santa leaving his big bag of toys on the porch at my other grandma’s house. Sitting on my father’s lap…I’m seven again…wearing my new sweater vest, my hair carefully curled by my mother earlier in the day. Timothy’s first Christmas. His eyes heavy with sleep, wearing his second hand puppy dog pajamas, as I woke him up in the wee hours of the morning…too excited to wait any longer. Tim yawning in the background…wrapped in a red and black blanket……starting our own traditions in the tiny one bedroom apartment we once called home. Laughing together as I helped decorate her tree on our last Christmas with her. I’m glad I didn’t know about the missing that waited for us…the ache a momma feels for her baby, I knew. But the ache a daughter feels for her mother still lay ahead as we added the decorations to her tree in between giggles. I can’t go back and conjure each moment into reality…but each memory is part of me, part of today…woven into the tapestry of this life. So, I will fill my tiny home with as many people I love and as much laughter as we can muster, for as many years as the Lord allows. Because laughing with people I love…this tiny house full…well…that’s my favorite. May you find joy and peace in this Christmas season as we celebrate the amazing gift…that Jesus came for us. May there be quiet moments of reflection, warm memories to fill your heart, and laughter, if you can muster it…laughing with people you love, imperfect and broken though we may be. There is hope. P.S. So desperate was I to release the words in the wee hours of this morning, this post was typed entirely on my phone. Impressive…or sad…whichever. But, if you’re a writer, you get it! Merry Christmas! That hasn’t happened for a while. I tossed and turned, wondering about the cause. I didn’t have caffeine late in the day. There wasn’t anything pressing on my mind…well, anymore than usual. Then, I remembered. It’s September. The September winds are blowing in, and even if my mind wasn’t dwelling on it, my body knew. It’s time to relive those days, the ones we do every autumn when the leaves change and the air grows crisp and cold. The excruciating days before we said goodbye to beautiful you…well, until we meet again, of course. I can’t believe it’s almost been six years. I miss you, mom. I miss you with more missing than I ever thought possible. Sometimes I can embrace the missing, knowing that it means I’ve loved someone dearly, someone worth missing. But, sometimes, I hate the missing. I know, nice Christian girls probably aren’t supposed to say hate. But, I do. I hate it. I miss my baby girls for the brief time they had with me, and for all the dreams I dreamed that never came to pass. I miss my son Thomas, and the quiet wisdom I knew he held within him. I miss countless things about my babies and the dreams we had for them. But, I miss my mother’s laugh. I miss her hazel-eyed glare. I miss her smoker’s cough. I miss the way she could walk into a room, her head bald with cancer, and still capture the attention and heart of every man in the room. I miss her hands, nails bitten down to nothing, and always cold. I miss the way she walked so fast when she shopped, she left us all breathless. I miss her telling us to get our elbows off the table, quit popping our gum, and sometimes even…stop breathing so loud. Manners were important to her. I miss standing in her kitchen…that isn’t even hers anymore. I even miss doing her endless amounts of dishes while listening to Chantilly Lace with the windows opened. I miss filling the cart with Christmas ornaments at Hills. She loved Christmas. I could fill pages with the missing. I miss my Dinah. I miss my grandparents. I miss the boys who once filled my kitchen and are now off having college adventures. I don’t love the way life changes and people go. I miss following Timothy on the golf course. There are so many changes and goodbyes this side of heaven. And, surely, there is joy and adventure, as well. I don’t want to sound all taken over with the Irish melancholy. There is hope after all. We find new friends and opportunities. God takes us down paths, growing us, drawing us closer to Him. Opening new doors when others close. But, can I just say, that I hate the missing? The best thing about heaven, will be basking in the glory of our God, sitting, literally, at the feet of our Jesus, walking with Him, talking with Him…forever. But, the second best thing. The second best thing, is no more missing. No more goodbyes. No more unhappy endings. No more bitterness or brokenness. No more sin, sickness, death, or sorrow. No more leaving or being left. No more things unsettled, left undone, misunderstood. Only sweet restoration, complete and beyond what our minds can imagine. Joy unending. Love abounding. Oh, how I long for that day…the day, when He makes all things new. When I was about nine or ten years old, we moved to Florida from Ohio. I remember the day my brothers’ father showed my mother the house he purchased for us to live in. It had white brick, with intercoms where we could speak to each other from room to room. I thought that was something special! The carpet was blue, with an open floor plan. Each bedroom had sliding glass doors that opened on to a patio that surrounded an in-ground pool. We had never lived in a place like this. We lived in a little trailer until I was in third grade, when we moved to a rental house. But, nothing like the house in Florida. Remember my last post…the one where I said I can’t remember seeing my mother cry? Well, I was mistaken…because the day we walked through the white brick house with blue carpet, she stood in the middle of the expansive family room and cried. “What’s wrong?” her husband asked. “It’s so beautiful…I don’t deserve a house like this,” her usually strong and certain voice quivered. In the factory she was strong and certain. In our old kitchen, she knew what to expect. She knew her place in the world, there. But, here, in this fancy house by the lake. This was unknown territory. Here, she felt like less…not enough. Unworthiness bubbled up from the deep hidden places. She wondered how a girl like her could ever fit in a place like that. She never did see how amazing she was. She thought her mistakes defined her…that she deserved less because of every wrong choice that brought her to this place. My strong, brave mother held her head low that day in the house with the intercoms. She just couldn’t believe something so beautiful was for her. She reacted the same way when she came face to face with Jesus, but that’s another story. Today, I began my own new journey, eyes filled with tears of joy and awestruck gratefulness, thinking a girl like me doesn’t deserve grace like this…wondering how it is I came to be here, sitting in my patio sanctuary, being filled with encouragement from God’s Word as the birds surround me with their songs of praise. For the first time in many years, I’m not spending my days at work and my nights juggling family and ministry. I pray on my patio and feel His grace wash over me in the morning. I have time to soak in every nuance of beauty from His creation. I notice the butterflies, the crickets’ song, the locusts reminding me that my God is the One who will restore the years. I count the gifts in my journal and tears mix with the overwhelming gratitude, the grace that shakes me and humbles me…and fills me to the brim. I prayed for years that I would be free to serve Him this way. Free to give out of abundance instead of stretched beyond what my senses could accomplish. I prayed that Tim would be free to use his gifts and abilities to provide for our family, that I would be able to spend the time needed to run SGM effectively. He is and I am…free. Much like my mother in the midst of the white-brick house, I stood today in the middle of my patio, in awe, that a girl like me gets grace like this. I know every wrong choice I’ve made, every dirty ugly sin. I don’t deserve grace like this. Several times a day, I find myself saying aloud, “I cannot believe this is my life”. I am His. My heart sings….I am His. I don’t get it…this scandalous grace that would make Him want a girl like me…this relentless love that pursues my damaged heart. But, that’s the whole point. That’s what makes it grace….the fact that I don’t deserve it. I’ve done nothing to earn His favor…nothing to deserve such love. Yet, He pursues…longing to bless even more. Longing to answer the cries of my heart. Because I am worthy? No, far from it. My best attempt at righteousness is a pile of filthy rags….but He is worthy. My Savior…the One who washed me clean with His blood. The One who tenderly meets me on the patio and lifts my head as it hangs in humility, wipes the tears dripping from my eyes, the ones that tell the story of the girl who doesn’t deserve to be in this patio sanctuary…and He calls me His. This weekend, I took the stage with these boys at our local Corn City Festival…boys I’ve known most of my life. To sing about being His. My father and his wife surprised me by swooping in from states away to hear our band…for the first time. Amazing grace…raining down on me. I breathed deeply, drinking in grace. Hearts bowed in worship…we are His. And, how does our beloved respond, to this most humble offering? He quiets us with His love…and rejoices over us…with singing. He rejoices over us…with singing. I rode my turquoise bike over the tracks, while listening to his chatter, wheels spinning, along with eleven year old tales. “Go straight”, I said, the winds of July missing and memories blowing strong. “Are you sure, mom?” he replied, looking back with the wrinkled brow of concern. I swallowed the lump swelling in my throat and crossed the next set of tracks, feeling the familiar tightening of my chest, the physical ache of missing. I looked to the left, noticing the pink flowered stencils she painted on the door during her mauve phase, still there, untouched. I breathed gratefulness at the site. Clothespins on the line. Her clothesline. The pole still red, white, and blue from her patriotic phase. Paint chipped, but there, standing proudly, nonetheless. A familiar face walked out the door, and our eyes met, shaking me back to the present. To reality. For a moment, all was just as she left it. For all I knew, she could be inside, on her white couch, Pebbles at her side, waiting for her grandkids to barrel in with their little boy stories. But, the woman who walked out of the house, intruding through the memories with her presence, reminded me of the truth. The ache intensified, gripping my heart, and I averted my eyes. Ashamed that even as I am about to have another birthday without her, I was compelled to go looking for a glimpse, knowing that I could search the entire earth and not find her. Like a little orphan girl, searching for her mama, I rode past her house anyway, looking with longing eyes. I closed my eyes as we rode over the creek bridge, the same one I rode over many summers ago, dreaming dreams of youth and love and possibility. When summer would go on forever, and my mother would always be there to drive me crazy, and I could still be anyone I wanted to be. The wind blew my hair and the frogs sang their song, the same wooing melody of summers’ past. We rode, and he chattered, my eyes stinging and heart aching. I suppose the missing is the price we pay for loving. It is an ache like no other, the missing. But, it is worth it. Loving is worth it, even in the agony of missing. This time is but a blink in light of eternity. It feels like years without her here. It has been years…more than five earth years. But, in heaven, it is but a blink. I hate those parties with the catalogs selling something high priced, with the sales person giving her spiel. Abhor baby showers, bridal showers, pretty much any gathering with the word shower and/or any event that may include pastel mints or some cheesy game no one wants to play. Most of the time I avoid the tupperware-type extravaganzas. Unless of course, I’m doing someone a favor. Then I will begrudgingly attend. Last night, it was the perfect storm for such an occasion. I had an empty house, and a bad case of procrastination with a long to-do list staring me in the face. That’s what drove me to go to my friend Raechel’s Scentsy party. (Actually, I walked…since she lives two doors down.) Yes, I know. Scentsy. Even the name makes me shudder a little. Not to disgust or offend my lovely friends who may take the time to melt wax in really expensive containers to make your house smell pretty. Nothing wrong with that at all, if it’s your thing. Lighting a candle is as high maintenance as I get with the scented stuff. A cheap candle…from WalMart. I don’t have time to worry about more than that, nor money to spend on maintaining the scent level of my home with packages of wax. Raechel was a lovely hostess, offering us a delicious array of appetizers and fun conversation. I smelled the samples until my nose couldn’t smell anymore. We laughed and enjoyed ourselves. Ok, so it wasn’t half bad for a catalog party! I even bought some car fresheners for the Tims and me. And, some body spray. Sorry…no chance I was buying the melty pot things and bars of wax to melt. The women were gathered in the kitchen. Most of the ladies in attendance were Raechel’s family. Mom, sister, aunt,, daughters. For a moment, I stood by the table, watching them laugh and chide one another with a familiar exchange. Bantering back and forth like we do with those we love…the ones we are most comfortable with…the ones who get us. And, there it was…sweeping in unexpectedly, as it always comes. The missing. The longing. I watched Raechel with her mom, an easy exchange between a mother and daughter. What I miss most about my mother is gathering in the kitchen. To laugh, joke, tease, share a tidbit of the days. I miss when I was young and Grandma and Aunt Cheryl would gather with us in Mom’s kitchen. We had the same easy way amongst ourselves. Same banter. Same safe place that only exists with those who truly know you…and get your silly quirks… and love you just the way you are. I miss gathering with my childhood friend, Nicki, in her Aunt Linda’s kitchen while generations of women baked delectable Christmas goodies. I ache to gather in Dinah’s marvelously eclectic kitchen…to laugh, to pray, to delve further into a morsel of His Word and chew on it a bit, to cry together…to feel at home. I miss gathering in Ginny’s kitchen with a brood of young children climbing all over the denim jumpers we spent our 20s wearing, covered in flour as we baked sugar cookies. And, I miss the bible studies in her dining room, when a blue haired, droopy pants-ed teenager named Amos took care of our brood of young ones so we could discuss passages in Corinthians. My mother, Aunt Linda, and Dinah no longer walk this Earth. Someone else fills their kitchens. Or maybe they sit empty, echoing silently with the years of laughter and memories that once reverberated off the walls. Ginny, Nicki, and I have our own kitchens. Our own busy lives that prevent most kitchen gathering moments. And, I suppose there will be times when my kitchen serves as a gathering place for women. My favorite times now are those when my house is filled with people I love, and the sounds of laughter as we gather in the kitchen. Gerken Baking Day. Holiday gatherings. The missing I feel for the women who met together once in the kitchen with me, is so intense. No one knows you like your mom…it’s true. Sometimes I feel so desperate to laugh with her in the kitchen, I’ve even dreamed about it. But, perhaps the time has come for me to fill my own kitchen…with whomever I can. I am limited on the women who fill my kitchen. Most of time, if my kitchen is full, it’s filled with boys. That makes me happy too. Listening to their stories…offering a place where someone “gets them”….and loves them just as they are. Maybe someday, those boys will bring wives to my kitchen, and we can gather and laugh and make new memories. Maybe their young ones will climb all over in the flour as we bake. (I can promise you, though, I will not be donning a denim jumper. Ever again.) Maybe it doesn’t have to be just women in the kitchen. Maybe it’s about family. And, not just the family that exists by blood…but those who are family in our hearts. In the busyness of life, it’s good to stop and remember that the things that make the most lasting impression on our lives and hearts aren’t the elaborate plans we make, or big trips we take, or even the ball games and other activities in which our children participate. It’s the simple gathering as a family in the kitchen. Or where ever. To laugh with the people who see us as we are…and love us anyway. My mother always said, in the simplest of times…when things were going well, or when they fell apart…”We’re making a memory.” She was right. My most precious memories will always be the daily moments we spent, gathering in her kitchen. So, I started looking through the pictures. The first box was a blend of my own high school pictures and Timothy’s baby pictures. The two events…his beautiful beginning and the ending of that era in my life, are blended together. It’s impossible to separate them, in the tempest of emotions. And, unfortunately for the few still reading here, words are my therapy. Prayer…and words on a page. My facebook wall is now covered with pictures from almost twenty years ago. I believe it’s official. Some sort of mid-life crisis has ensued and it’s now evident publicly. Don’t worry…it’s a Kelly-style mid-life crisis. Hopefully the worst that will happen is some heavy doses of nostalgia, some laughing with old friends over shenanigans from years ago, and a facebook wall full of pictures from the big-haired glory days of the 90s. I won’t lie, I miss my young-pre-pregnancy hair. It was fabulous. Although our 10 year old, James said it was actually fuzzy, not fabulous. Oh well…beauty is in the eye of the beholder, I guess. I found this beauty among the pictures. My mother and I: young, carefree, happy. No cancer. Life still ahead, full of possibility. On a good day, she and I were unstoppable. This week, my son’s high school performed Bye, Bye Birdie…the play in which I performed the lead role during my senior year…nineteen years ago. I haven’t been to a musical in 19 years, but our “adopted by friendship” son, Ian, has a way of talking me into things. I went. Nostalgia flooded my senses as I watched the beautiful young lady play the role of Spanish Rose. After the play, I was telling Timothy and Hannah about the differences in the play when we performed it years ago. We were looking at old pictures and watching some of my old musical performances on VHS. I loved playing a part on the stage. It has been so long. But, in those days, it was the only time I felt free and at home in my skin…ironically while not being me. Playing the part of someone else gave me confidence to sing with abandon. I threw myself into every role. It was the only time I wasn’t plagued with stage fright. Well, then, and when I sang in church. No coincidence there, I’m sure. As I heard my grandmother’s voice from behind the camera, taping the exchange, so proud of her first granddaughter who would be crowned queen that evening, and as I watched our mother-daughter exchange, the tears fell. I haven’t seen her face or heard her voice, or watched her move around with the busy, purposefulness of a mother in over five years. “Mom”…I said through the tears, sounding more like a little girl than the mother of a grown-up man. I longed for the camera to focus off my youthful face, the sash neatly hanging to the side of my red Homecoming suit, and on to my sweet mother. I strained for a glimpse of her, listened for her voice, desperate to soak in any nugget of her presence. I watched the procession, listened to the words of the announcer as I walked down the football field, while he spoke of all my high school accomplishments and the bright future plans ahead. The recorder picked up my mother squeezing in to take a picture of her daughter. I heard my grandpa call me a ham into the recorder as newspapers snapped our picture, and one of the nicest football players in the school placed a crown on my head. It flashed to the dance, where my mom walked by the camera, beautiful in her pixie hair cut, flawless and young. I danced with the king in my red suit. I made Timothy rewind and play it again so I could hear her voice…see her face, one more time. Oh, how I long for the sweet day when I will never have to live with the ache of missing that beautiful face and hearing her voice. It’s funny how crazy she made me back then. And how much I long for her now. In the midst of the mid-life crisis nostalgia, I am soaking in every moment with my grown up boy. Today I watched him run his first track meet. In previous years, he began to prepare for the golf tournament season in the spring, so track was out of the question. I am excited to watch him participate in one more high school activity before it’s all over. Seems fitting…crowns and races and such. Running in such a way that we will receive the prize…the imperishable crown. Not the rhinestone encrusted homecoming crown this world full of things that will surely perish offers…but the true prize of eternal life with Him. When I get there, I’m going to hug my mom and listen to her talk to me, basking in the promise of no more goodbyes, and eternal life with the Savior of my soul. For now…we run the race. I need to get up for work in an hour, and I haven’t slept. That’s my disclaimer. I am not responsible for the outpouring of words about to emerge from my weary mind. This post isn’t going to be neat and tidy. If you’re a publisher who has somehow happened upon my tiny, obscure little blog in the wee hours of a Tuesday morning, don’t judge this work as my best. If you’re a local (or a teenager) this next sentence will make more sense to you. If Mrs. Frania were grading this post, I would surely fail. Formatting and sentence structure will not be joining us this morning. Graduation is less than two months away. And, I am avoiding the pictures, partly because gathering 18 years worth of pictures that are not organized, but rather scattered willy nilly in random Rubbermaid containers and boxes seems too monumental to tackle at the end of a work day, or you know…when the sun’s out….and partly because I don’t know if I can look at these tender years laid before me. My heart may come undone. He has been here for all of my adult life. He has never been away from home for more than a few days. Who he is has shaped so much of who I am. What will it be like when he isn’t sleeping in his Notre Dame bedroom? I am the mother to a grown up man. Can I be small and share something that is not-at-all of deep spiritual significance? Something completely separate from the truth that I would not trade a moment of being a mother to all of my five children? I do not know how, as a woman, to wrap my mind around being the mother to a grown up man. You know…identity wise. In reality, I am loving every minute of this season of motherhood. Soaking it all in. Treasuring every moment with my children…and especially taking time for the oldest as these moments are fleeting. I love him, love his friends, love our house full of boys. They bring me great, fulfilling joy that I wouldn’t trade for anything. I know our identity is in Christ. Our beauty should not be of outward adornment only. I have written about embracing the beauty of right now. I believe the words I’ve written. But, I do still live on planet earth. And, in the quiet of my mind and heart, I realize there is a great shift occurring in the mom/woman cosmos for me. (Guess I’m not leaving it in the quiet of my mind and heart right now.) The truth is, I am wrestling a bit with getting older. While I’m still young to many, I’ve lived a lot of life. I was always in such a hurry to be grown up, rush to the next season. I’m just now learning the art of savoring…counting the gifts. (Thank you Ann Voskamp.) But, in truth, my soul has been old since I was 18. I became a mom and wife, and didn’t look back. In many ways, that saved me. I don’t regret it. Not for a moment. I haven’t given it much thought at all until right now. I was busy, being a momma. Too busy to notice what it meant for me as a woman. No regrets. Our children should matter more than our identity. But, the idea of being a mother to an adult. The idea of this time coming to an end. I know all the words you may will feel tempted to comment about how this is the way it’s supposed to be, children grow up. And remember that this earth is not all there is. Focus on the Lord. Serve Him. Be about your Father’s business. Be proud of the son you’ve raised. I am. I am to all of the above. (And, please, mommas whose little ones are still sleeping soundly in their beds, running around at your feet, holding your hand, saying the sweetest earthly name with their tiny voices, filling your arms and your days…please don’t tell me to embrace the adventure…or that you will do this so much better when you get here…or that you can’t wait for this day. We don’t know until we get here the grace we will need to actually walk this path.) And, anyway… I am embracing the adventure. These feelings are separate to all of this. This is about being a woman. I was the youngest mom/woman for a long time, in many circles. But the tide is turning, and in the recesses of my heart, I am reconciling what that feels like with what I know to be true. I notice that I’m not getting younger, and can never look 20 again. I believe a woman can be beautiful and attractive in every season of life. My mother was one of those women. When I was a young teenager, boys would come over to look at my mother. Check out boys at the grocery store (some of whom I dated) were always fond of her. Men that attended school with her told me as they walked through the line at her funeral visitation that they always thought she was the most beautiful girl they knew. When she was bald and wasting away with cancer, she put on a dress, donned her cane and came to church with me. Several men mentioned her great beauty to me. She radiated something from inside that made her beautiful. She was classy and her smile was warm and shone from her eyes. She was always so much more than she knew…and maybe that was part of what made her so attractive. I’m not really sure what my point is. Warned you this wouldn’t be a tidy post with deep spiritual meaning. This may be the most of a mid-life crisis a believer in Christ is allowed to have. Waxing poetic with some thoughts of fleeting youth and beauty to wrestle with in the wee hours of the morning poured out on the internet, because that’s how we roll in 2012. I love my turquoise bike. It has what I call a mama bottom seat. You know, a seat made for a mama-sized bottom. Not some tiny uncomfortable contraption. I had been eyeing it for awhile, looking longingly through the window of our small town hardware store each time I rode by on my hand-me-down ten speed, taken by the way the sun reflected off it’s frosty blue goodness. It was July, several years ago…the week of my birthday…when Tim handed me the money and told me to go get the bike as a present. The first place I rode my new bike was to my mother’s house. She smiled and said that she was just about to do the same thing. 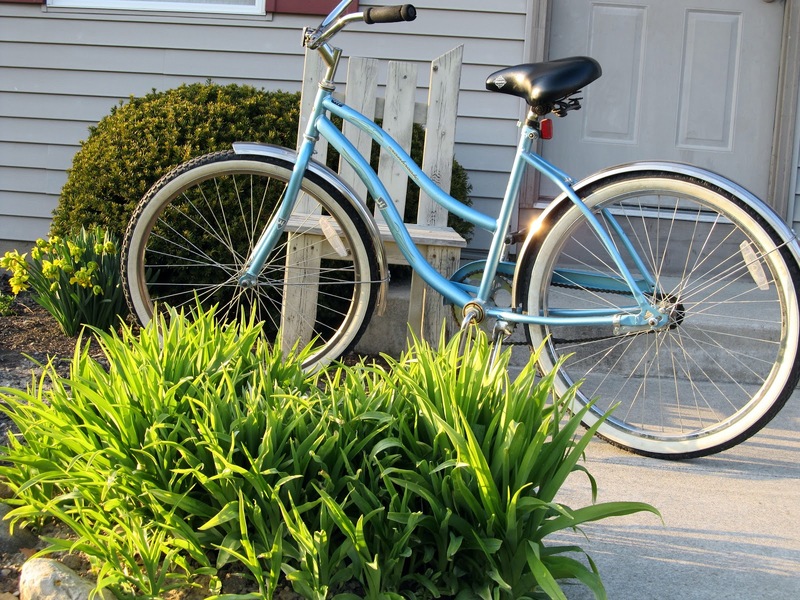 She knew how I loved to ride my bike, and how much I had wanted the shiny turquoise bike that had been calling to me from the hardware store window. She bought me a pink backpack, instead…to carry my library books when James and I rode our bikes to get books. Her house was always on my bike route. And, we would often stop there to pet her dog Pebbles, get James a drink (he is always thirsty), and grab some tomatoes from the garden. Even after she went home to heaven, her house remained on our route. We would stop and chat with Grandpa, pet Pebble, and get James a drink. I still ride my bike, sometimes with James chatting away alongside me, and sometimes on my own. And, her house is still on our bike route. Only now, it isn’t her house anymore, or mine, or the house of my children’s grandmother. Someone else has bought my mother’s house. Her husband remarried and moved away last summer. Someone else will wash the dishes in the sink that I washed so many dishes in, while listening to the oldies with the summer breeze blowing the scent of lilacs in the windows, and the faint whir of mopeds humming in the distance. The first bike ride we took this year we went around the reservoir lifting our legs as our bike sped down the muddy hill, life blooming all around as spring awakens from its winter sleep. Her house came into view. And, I stopped, overwhelmed with the nostalgia washing over me. My eyes settled on the deck Tim built, where I sat on the swing, watching the boys swim in the pool that’s no longer there. My throat swelled, and I shook the tears away. James was with me, and I didn’t want to dwell long on the sad. I didn’t want to ruin the first bike ride of spring. Still, my heart ached with such longing I could barely breathe. Last week, I started off on my ride, alone, over the creek bridge, muddy waters rushing fast, full of spring rain. I crossed the bumpy railroad tracks that surround my neighborhood and past the Methodist church, rode around the school, past the pool park and around the ball diamond, remembering the summers when all my friend Nicki and I did was ride around town, waiting for something to happen and dreaming our summer dreams. I crossed Main Street and Ron’s Super Valu, then over more bumpy tracks until I reached her road. I’ve mentioned before how each season, the missing washes over me anew. Spring is no exception. But this year, this year is different. This year, when I ride past her house, the house where I grew up, I cannot stop and get a water and pet Pebbles. I road by, drinking in the sight, allowing the ache to fully envelope me. My eyes settled where the flag used to fly so proudly, her rock garden that she and Grandpa proudly laid by hand, the pink stencil she painted on the gas tank. Her lilac bush, not yet blooming. And, her clothesline…with the clothespins still clipped to the top. She loved to hang the clothes out to dry in the summer breeze, and was quite dedicated, even tromping out in the mud in her snow boots. That did it. The tears spilled over, and my chest heaved, as I pedalled away from the memories, the hurt, and the missing. Or I tried, but it followed me. It followed me as I rode over the bridge where the wildflowers bloom tall in the summer and past the field still muddy with spring, over the tracks again and around the reservoir hill. Still…I pedalled my turquoise bike, tears streaming, chest heaving. By the time I rounded the corner of my road and pulled into my stone driveway, the tears were dry. I rolled the turquoise bike into the garage, hugged my husband, and started supper for my family. Time marches on, and the missing washes over me anew each season. It probably always will. Even more reason to make memories with those we love. Even more reason to soak in the gift of right now, with a grateful heart. Even more reason to cling to Jesus, and not the fleeting things of this world. For, no season on this earth lasts forever. A Blessed Easter to you and yours….love and prayers for those missing someone during this spring season of hope and renewal. I survived my first ever Black Friday experience intact. As a matter of fact, I enjoyed a rather peaceful drive to my friend Nicki’s house in the wee hours of the morning, smiling at the memories of shopping with my mother and laughing at the hysterical “good-bye” note written to me by my oldest son on a paper plate…showing tongue-in-cheek concern for my safety. I took the road with the belly-getter hills, thinking of her. It felt as if she was in the car with me, the memories were so close. I could sense one of those Daddy’s little girl days in the works…you know, those days when it’s evident God has gone before you and leaves little blessings throughout the day…and you feel just like “Daddy’s little girl”. I wish I had something more exciting to report, but other than one disconcerting moment when a pack of wild dingo-type shoppers dove in front of us for some item I couldn’t see under the pile, I saw nothing disorderly. We quickly found the bargain I was looking for, were handed a ticket by a polite Wal Mart employee, and waited in a short orderly line for the coveted item. I saved $40 on the gift for our youngest son…and jumped up and down after the purchase! We finished our shopping and checked out in lawn and garden without even waiting in line! Please pray for us as we prepare for tomorrow. Our band, One Way, will be doing the worship music at Holgate United Methodist Church and I will be sharing our family/ministry testimony. Please pray that the Lord would go before us, that He would give the words, that others would be encouraged and that He would be glorified. On a personal note, this is only the second time my husband, Tim, has heard me share the account of our journey. And, it can bring so many emotions for us. Praying for His strength…that He would enable us to be vessels for Him…even in our broken, imperfect state. Also..don’t forget to join us on Monday to kick off the SGM Christmas Extravaganza 2010. We will be sharing the ways that we remember our loved ones at Christmas and other memories. Be ready to link your post on the Walking With You page on Monday. This is for anyone missing someone they love this year….not just grieving parents. And, there will be some blessings offered to those who participate…yes, I am bribing you…but it’s for your own good! We’ll call it incentive…or positive reinforcement. =) I hope you will join us. It was a blessing for those who participated last year.